They are now just a fading memory, but a generation of bulky, upright checker taxicabs once roamed the streets of american cities before giving way to less sturdy but more fuel-efficient sedans. Each year, checker also made several hundred to 1,000 practically identical passenger cars. The first private cars located in kalamazoo, michigan, checker began making taxicabs in 1923. For i960 the company introduced its first passenger cars, the short-lived superba sedan and station wagon, built on a 120-in. Wheelbase. The next year, the marathon series almost the same except for a chrome side spear and different grille treatment made its debut. The station wagon and a sedan and limousine were dropped after 1974. built to last the chief advantage of the appropriately named marathon was its durability: 300,000 miles of service was not unusual. The sedans interior was not especially spacious, but its height of 63 in. Would have delighted max headroom. The original continental six-cylinder engine was replaced after 1964 by a chevrolet six, with chevy v8s optional. Automatic transmission became standard for 1972. Power disc brakes and power steering began with 1973 models. 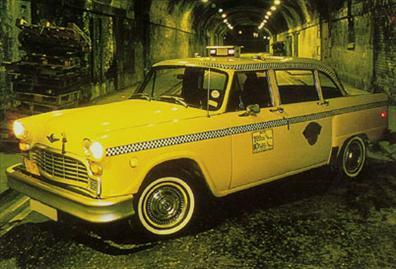 The checker marathon four-door sedan was the private-car version of this taxicab style.